Box jellyfish (class Cubozoa) are cnidarian invertebrates distinguished by their cube-shaped medusae. Some species of box jellyfish produce extremely potent venom: Chironex fleckeri, Carukia barnesi and Malo kingi. Stings from these and a few other species in the class are extremely painful and can be fatal to humans. At least 51 species of box jellyfish were known as of 2018. These are grouped into two orders and eight families. A few new species have since been described, and it is likely that additional undescribed species remain. 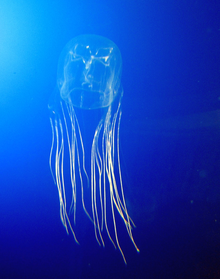 The medusa form of a box jellyfish has a squarish, box-like bell, from which its name is derived. From each of the four lower corners of this hangs a short pedalium or stalk which bears one or more long, slender, hollow tentacles. The rim of the bell is folded inwards to form a shelf known as a velarium which restricts the bell's aperture and creates a powerful jet when the bell pulsates. As a result, box jellyfish can move more rapidly than other jellyfish; speeds of up to 6 metres (20 ft) per minute have been recorded. In the center of the underside of the bell is a mobile appendage called the manubrium which somewhat resembles an elephant's trunk. At its tip is the mouth. The interior of the bell is known as the gastrovascular cavity. It is divided by four equidistant septa into a central stomach and four gastric pockets. The eight gonads are located in pairs on either side of the four septa. The margins of the septa bear bundles of small gastric filaments which house nematocysts and digestive glands and help to subdue prey. Each septum is extended into a septal funnel that opens onto the oral surface and facilitates the flow of fluid into and out of the animal. The box jellyfish's nervous system is more developed than that of many other jellyfish. They possess a nerve ring around the base of the bell that coordinates their pulsing movements, a feature found elsewhere only in the crown jellyfish. Whereas some other jellyfish have simple pigment-cup ocelli, box jellyfish are unique in the possession of true eyes, complete with retinas, corneas and lenses. Their eyes are set in clusters called rhopalia, located in pockets halfway up the outer, flat surfaces of the bell. Each contains two rhopalial ocelli with lenses, one directed upwards and the other downwards and inwards towards the manubrium. This enables the animal to see specific points of light, as opposed to simply distinguishing between light and dark. Box jellyfish also have twenty ocelli (simple eyes) that do not form images, but detect light and dark; they therefore have a total of twenty-four eyes. Near the rhopalia are statoliths which detect gravitational pull and help the animal to orient itself. Box jellyfish also display complex, probably visually-guided behaviors such as obstacle avoidance and fast directional swimming. Research indicates that, owing to the number of rhopalial nerve cells and their overall arrangement, visual processing and integration at least partly happen within the rhopalia of box jellyfish. The complex nervous system supports a relatively advanced sensory system compared to other jellyfish, and box jellyfish have been described as having an active, fish-like behavior. A fully grown box jellyfish can measure up to 20 cm (7.9 in) along each box side (or 30 cm (12 in) in diameter), and the tentacles can grow up to 3 m (9.8 ft) in length. Its weight can reach 2 kg (4.4 lb). There are about 15 tentacles on each corner. Each tentacle has about 500,000 cnidocytes, containing nematocysts, a harpoon-shaped microscopic mechanism that injects venom into the victim. Many different kinds of nematocysts are found in cubozoans. Although the notoriously dangerous species of box jellyfish are largely restricted to the tropical Indo-Pacific region, various species of box jellyfish can be found widely in tropical and subtropical oceans, including the Atlantic Ocean and the east Pacific Ocean, with species as far north as California (Carybdea confusa), the Mediterranean Sea (Carybdea marsupialis) and Japan (such as Chironex yamaguchii), and as far south as South Africa (for example, Carybdea branchi) and New Zealand (such as Copula sivickisi). It has been found that the statoliths, which are composed of calcium sulfate hemihydrate, exhibit clear sequential incremental layers, thought to be laid down on a daily basis. This has enabled researchers to estimate growth rates, ages, and age to maturity. Chironex fleckeri, for example, increases its inter-pedalia distance (IPD) by 3 mm (0.12 in) per day, reaching an IPD of 50 mm (2 in) when 45 to 50 days old. The maximum age of any individual examined was 88 days by which time it had grown to an IPD of 155 mm (6 in). The box jellyfish actively hunts its prey (small fish), rather than drifting as do true jellyfish. They are capable of achieving speeds of up to 1.5 to 2 metres per second or about 4 knots (7.4 km/h; 4.6 mph). The venom of cubozoans is distinct from that of scyphozoans, and is used to catch prey (small fish and invertebrates, including prawns and bait fish) and for defence from predators, which include the butterfish, batfish, rabbitfish, crabs (blue swimmer crab) and various species of turtle including the hawksbill sea turtle and flatback sea turtle. It seems that sea turtles are unaffected by the stings because they seem to relish box jellyfish. Although the box jellyfish has been called "the world's most venomous creature", only a few species in the class have been confirmed to be involved in human deaths, and some species pose no serious threat at all. In Australia, fatalities are most often caused by the largest species of this class of jellyfish, Chironex fleckeri. Researchers at the University of Hawaii's Department of Tropical Medicine found the venom causes cells to become porous enough to allow potassium leakage, causing hyperkalemia, which can lead to cardiovascular collapse and death as quickly as within 2 to 5 minutes. It was postulated that a zinc compound may be developed as an antidote. In Australia, C. fleckeri has caused at least 64 deaths since the first report in 1883, but even in this species most encounters appear to result only in mild envenoming. Most recent deaths in Australia have been in children, which is linked to their smaller body mass. In parts of the Malay Archipelago, the number of lethal cases is far higher (in the Philippines alone, an estimated 20-40 die annually from Chirodropid stings), probably owing to limited access to medical facilities and antivenom, and the fact that many Australian beaches are enclosed in nets and have vinegar placed in prominent positions allowing for rapid first aid. Vinegar is also used as treatment by locals in the Philippines. The recently discovered and very similar Chironex yamaguchii may be equally dangerous, as it has been implicated in several deaths in Japan. It is unclear which of these species is the one usually involved in fatalities in the Malay Archipelago. In 1990, a 4-year-old child died after being stung by Chiropsalmus quadrumanus at Galveston Island in the Gulf of Mexico, and either this species or Chiropsoides buitendijki are considered the likely perpetrators of two deaths in West Malaysia. Warning signs and first aid stations have been erected in Thailand following the death of a 5-year-old French boy in August 2014. A woman died in July 2015 after being stung off Ko Pha Ngan, and another at Lamai Beach at Ko Samui on 6 October 2015. At least two deaths in Australia have been attributed to the thumbnail-sized Irukandji jellyfish. Those who fall victim to these may suffer severe physical and psychological symptoms, known as Irukandji syndrome. Nevertheless, most victims do survive, and out of 62 people treated for Irukandji envenomation in Australia in 1996, almost half could be discharged home with few or no symptoms after 6 hours, and only two remained hospitalized approximately a day after they were stung. In Australia (mainly northern; however, box jellyfish can live in subtropical waters as far south as Sydney, with Carybdea marsupialis being recorded as far south as Bermagui, Sapphire Coast) the highest risk period for the box jellyfish is between October and May, but stings and specimens have been reported all months of the year. Similarly, the highest risk conditions are those with calm water and a light, onshore breeze; however, stings and specimens have been reported in all conditions. Wearing pantyhose or full body lycra suits during diving (both by women and men, also under scuba-diving suit) is an effective protection against box jellyfish stings. The pantyhose were formerly thought to work because of the length of the box jellyfish's stingers (nematocysts), but it is now known to be related to the way the stinger cells work. The stinging cells on a box jellyfish's tentacles are not triggered by touch, but are instead triggered by the chemicals found on skin; the chemicals are not present on the hose's outer surface, so the jellyfish's nematocysts do not fire. Once a tentacle of the box jellyfish adheres to skin, it pumps nematocysts with venom into the skin, causing the sting and agonizing pain. Flushing with vinegar is used to deactivate undischarged nematocysts to prevent the release of additional venom. A 2014 study reported that vinegar also increased the amount of venom released from already-discharged nematocysts; however, this study has been criticized on methodological grounds. Although commonly recommended in folklore and even some papers on sting treatment, there is no scientific evidence that urine, ammonia, meat tenderizer, sodium bicarbonate, boric acid, lemon juice, fresh water, steroid cream, alcohol, cold packs, papaya, or hydrogen peroxide will disable further stinging, and these substances may even hasten the release of venom. Heat packs have been proven for moderate pain relief. Pressure immobilization bandages, methylated spirits, or vodka should never be used for jelly stings. In severe Chironex fleckeri stings cardiac arrest can occur quickly. In 2011, researchers at the University of Hawaii announced that they had developed an effective treatment against stings by Hawaiian box jellyfish by "deconstructing" the venom contained in their tentacles. Its effectiveness was demonstrated in the PBS NOVA documentary Venom: Nature's Killer, originally shown on North American television in February 2012. Their research found that zinc gluconate prevented the disruption of red blood cells and reduced the toxic effects on the cardiac activity of research mice. ^ "WoRMS - World Register of Marine Species - Cubozoa". marinespecies.org. Retrieved 2018-03-19. ^ Bentlage B, Cartwright P, Yanagihara AA, Lewis C, Richards GS, Collins AG (February 2010). "Evolution of box jellyfish (Cnidaria: Cubozoa), a group of highly toxic invertebrates". Proceedings. Biological Sciences. 277 (1680): 493–501. doi:10.1098/rspb.2009.1707. PMC 2842657. PMID 19923131. ^ a b c d Lewis C, Bentlage B (2009). "Clarifying the identity of the Japanese Habu-kurage, Chironex yamaguchii, sp nov (Cnidaria: Cubozoa: Chirodropida)" (PDF). Zootaxa. 2030: 59–65. ^ a b Gershwin L, Gibbons M (2009). "Carybdea branchi, sp. nov., a new box jellyfish (Cnidaria: Cubozoa) from South Africa" (PDF). Zootaxa. 2088: 41–50. ^ a b Gershwin, L. A.; Alderslade, P (2006). "Chiropsella bart n. sp., a new box jellyfish (Cnidaria: Cubozoa: Chirodropida) from the Northern Territory, Australia" (PDF). The Beagle, Records of the Museums and Art Galleries of the Northern Territory. 22: 15–21. Archived from the original (PDF) on 2009-09-27. ^ a b c Ruppert, Edward E.; Fox, Richard, S.; Barnes, Robert D. (2004). Invertebrate Zoology, 7th edition. Cengage Learning. pp. 153–154. ISBN 978-81-315-0104-7. ^ Barnes, Robert D. (1982). Invertebrate Zoology. Philadelphia, PA: Holt-Saunders International. pp. 139–149. ISBN 0-03-056747-5. ^ "Jellyfish Have Human-Like Eyes". LiveScience. 2007-04-01. Retrieved 2012-08-27. ^ a b Pitt, Kylie A.; Lucas, Cathy H. (2013). Jellyfish Blooms. Springer Science & Business Media. p. 280. ISBN 978-94-007-7015-7. ^ a b Skogh C, Garm A, Nilsson DE, Ekström P (December 2006). "Bilaterally symmetrical rhopalial nervous system of the box jellyfish Tripedalia cystophora". Journal of Morphology. 267 (12): 1391–405. doi:10.1002/jmor.10472. PMID 16874799. ^ Nilsson DE, Gislén L, Coates MM, Skogh C, Garm A (May 2005). "Advanced optics in a jellyfish eye". Nature. 435 (7039): 201–5. doi:10.1038/nature03484. PMID 15889091. ^ a b c d "Box Jellyfish, Box Jellyfish Pictures, Box Jellyfish Facts". NationalGeographic.com. Retrieved 2012-08-27. ^ Gershwin, L (2006). "Nematocysts of the Cubozoa" (PDF). Zootaxa (1232): 1–57. ^ Straehler-Pohl, I.; G.I. Matsumoto; M.J. Acevedo (2017). "Recognition of the Californian cubozoan population as a new species Carybdea confusa n. sp. (Cnidaria, Cubozoa, Carybdeida)". Plankton Benthos Res. 12 (2): 129–138. ^ "Girl survives sting by world's deadliest jellyfish". Daily Telegraph. London. 27 April 2010. Retrieved 11 December 2010. ^ Salleh, Anna (13 December 2012). "Box jelly venom under the microscope". Australian Broadcasting Corporation. ^ a b Centre for Disease Control (November 2012). "Chironex fleckeri" (PDF). Northern Territory Government Department of Health. Archived from the original (PDF) on 2016-07-09. Retrieved 2018-11-10. ^ a b Daubert, G. P. (2008). "Cnidaria Envenomation". eMedicine. ^ Fenner PJ, Williamson JA (1996). "Worldwide deaths and severe envenomation from jellyfish stings". The Medical Journal of Australia. 165 (11–12): 658–61. PMID 8985452. ^ "Box jellyfish warning in Ko Phangan". Bangkok Post. 25 August 2014. 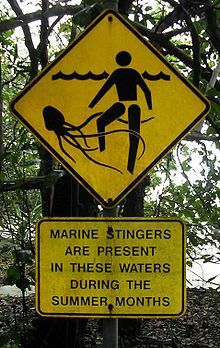 ^ "Jellyfish warning for travellers swimming in Thailand". Tourism Authority of Thailand Newsroom. TAT. Retrieved 24 May 2015. ^ "Box jellyfish sting kills woman in Koh Phangan - Phuket Gazette". phuketgazette.net. 3 August 2015. Retrieved 15 March 2018. ^ Fenner PJ, Hadok JC (October 2002). "Fatal envenomation by jellyfish causing Irukandji syndrome". The Medical Journal of Australia. 177 (7): 362–3. PMID 12358578. ^ Gershwin, L (2007). "Malo kingi: A new species of Irukandji jellyfish (Cnidaria: Cubozoa: Carybdeida), possibly lethal to humans, from Queensland, Australia". Zootaxa. 1659: 55–68. ^ a b Little M, Mulcahy RF (1998). "A year's experience of Irukandji envenomation in far north Queensland". The Medical Journal of Australia. 169 (11–12): 638–41. PMID 9887916. ^ "Facts About Box Jellyfish". Guardian.com. Retrieved 2016-07-29. 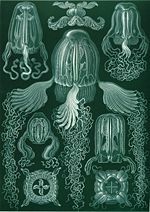 ^ "Jellyfish: A Dangerous Ocean Organism of Hawaii". Archived from the original on 2001-11-17. Retrieved 2010-10-06. ^ "Hanauma Bay closed for second day due to box jellyfish". Retrieved 2010-10-06. ^ Wilcox, Christie (9 April 2014). 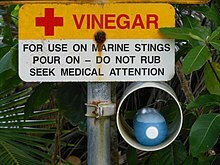 "Should we stop using vinegar to treat box jelly stings? Not yet—Venom experts weigh in on recent study". Science Sushi. Discover Magazine Blogs. Retrieved 26 April 2015. ^ Zoltan TB, Taylor KS, Achar SA (June 2005). "Health issues for surfers". American Family Physician. 71 (12): 2313–7. PMID 15999868. ^ Fenner P (2000). "Marine envenomation: An update – A presentation on the current status of marine envenomation first aid and medical treatments". Emerg Med Australasia. 12 (4): 295–302. doi:10.1046/j.1442-2026.2000.00151.x. ^ Taylor, G. (2000). "Are some jellyfish toxins heat labile?". South Pacific Underwater Medicine Society Journal. 30 (2). ISSN 0813-1988. OCLC 16986801. Retrieved 2013-11-15. ^ Hartwick R, Callanan V, Williamson J (January 1980). "Disarming the box-jellyfish: nematocyst inhibition in Chironex fleckeri". The Medical Journal of Australia. 1 (1): 15–20. PMID 6102347. ^ Seymour J, Carrette T, Cullen P, Little M, Mulcahy RF, Pereira PL (October 2002). "The use of pressure immobilization bandages in the first aid management of cubozoan envenomings". Toxicon. 40 (10): 1503–5. doi:10.1016/S0041-0101(02)00152-6. PMID 12368122. ^ Little M (June 2002). "Is there a role for the use of pressure immobilization bandages in the treatment of jellyfish envenomation in Australia?". Emergency Medicine. 14 (2): 171–4. doi:10.1046/j.1442-2026.2002.00291.x. PMID 12164167. ^ Pereira PL, Carrette T, Cullen P, Mulcahy RF, Little M, Seymour J (2000). "Pressure immobilisation bandages in first-aid treatment of jellyfish envenomation: current recommendations reconsidered". The Medical Journal of Australia. 173 (11–12): 650–2. PMID 11379519. ^ Yanagihara AA, Shohet RV (12 December 2012). "Cubozoan venom-induced cardiovascular collapse is caused by hyperkalemia and prevented by zinc gluconate in mice". PLOS One. 7 (12): e51368. doi:10.1371/journal.pone.0051368. PMC 3520902. PMID 23251508. ^ Wilcox, Christie (12 December 2012). "Don't Pee On It: Zinc Emerges As New Jellyfish Sting Treatment". scientificamerican.com. Retrieved 31 August 2018. This page was last edited on 26 December 2018, at 18:19 (UTC).